There are 36 holes in total and different architects designed each 18 holes. The B Course is flatter and longer than the tight roller coaster A Course. Each green is heavily guarded by bunkers and/or water, which are a often feature of Nicklaus designed courses. Landscaped greens and the surrounding areas are beautiful with soft defined contours. A challenging par 3 over water. The green is guarded by a lake as well as bunkers. A sharp dogleg to the left with a lake running along the left side of the fairway. The drive must carry over water. The safer play avoiding water is to play down the right side although this leaves a longer approach shot to the elevated double-tiered green. An excellent layout utilizing a natural lake positioned on the right of the fairway. An intimidating tee with a narrow fairway and a hill on the left side with water on the right . The second shot is over the lake crossing the fairway approximately 150 yards from the green. The approach shot requires you to hit the right side of the peninsula shapedgreen protruding from the lake. The greem is two tiered with a slope. If the pin is positioned on the right, which is on the lower tier the testing approach shot must be accurately struck to a small landing area surrounded by water . You can’t help the beautifully contoured bunkers on this uphill par 5 which seem to come into play on every shot. The moderately undulating green is triple-tiered and can make for an interesting put if you land on the wrong tier. The alignment of the bunkers is beautiful on this hole, too. A series of bunkers are placed in a row on the right side of the fairway, which catch 230-yard drives. The second shot is up hilland must not be left short if you want to avoid cavernous bukers guarding the green . Even though your shot may land on the green unless you can generate some spin, it can easily roll into rough behind the green ,from where it is hard to save par. A long par 4. Bunkers guard the green in front and to the right. A downhill par 3 over water. The contrast among the green, a lake and bunkers make for a scenic view on this hole, too. A very interesting hole to finish and a good par 5. A little drawback is the blind tee shot. However, there are a number of options to choose between on the second & third shots depending on how aggressively you want to attack this hole. The fairway is split down the middle divided by a creek on the second shot. The right the approach shot. If you choose the left hand fairway, the landing area between the creek hand fairway requires you to hit over the pond leaving you an approach shot to the green with the creek on the left side (, so be careful with on the right and the side hill rough on the left is relatively narrow , with the creek frontingthe green catches any short approaches. The luxurious clubhouse is another great feature. It takes 1hour and 40 minutes from Hong Kong to Zhongshan Harbor by ferry and another 20 minutes by club bus. It takes 45 minutes from Zuhai by taxi. Lee Schmidt & Brian Curley have designed the other courses in Asia, Muang Kaew GC (remodeled), Chiang Mai Highlands G&SR, Amata Spring CC in Thailand and Grande Hamanako GC in Japan. Lee Schmidt worked for Pete Dye for seven years as an assistant and then seven years as Senior Design Associate for Nicklaus Design with extensive international experience. 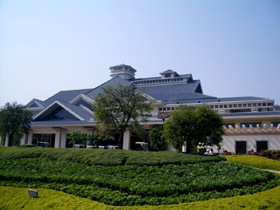 Lee Schmidt & Brian Curley’s joint designs with Jack Nicklaus are Spring City (春城) Ｇ＆ＬＲ - Mountain Course, Chung Shan Hot Spring (中山溫泉) GC - Jack Nicklaus Course in China, Ishioka GC, Rokkou Kokusai GC (remodeled), The Tradition GC, President GC, Sanyo GC (remodeled), New Capital GG, Sun Belgravia GC, Bear Paws Japan GC in Japan, Sungai Long CC in Malaysia, and Springfield Royal CC in Thailand. Also, they are joint designers of 8 out of 10 courses at Mission Hills GG, the largest golf complex in the world, such as the Faldo Course or Ozaki Course.